^ "ISTC". Retrieved 16 May 2009. ^ "Incunabula". Bayerische Staatsbibliothek. Retrieved 20 May 2013. 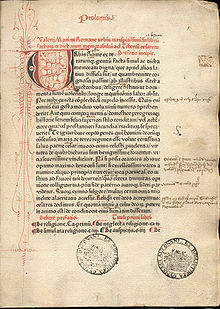 ^ "Incunabula Collections". British Library. Retrieved 20 May 2013. ^ "Les Incunables". Bibliothèque nationale de France. Retrieved 7 September 2013. ^ "All catalogues". Vatican Library. Retrieved 21 May 2013. ^ "Research on Holdings". Österreichische Nationalbibliothek. Retrieved 30 September 2012. ^ "Rare Books (Western) - Bodleian Library". Bodleian Library, University of Oxford. Retrieved 15 November 2012. ^ "Incunabula Cataloguing Project". Cambridge University Library. Retrieved 30 March 2012. ^ "Guida rapida: Informazioni utili" (in Italian). Biblioteca Nazionale di Napoli. Retrieved 7 March 2011. ^ "Zahlen und Fakten" (in German). Staatsbibliothek zu Berlin. Archived from the original on 20 June 2010. Retrieved 7 March 2011. ^ "Incunabula". National Library of the Czech Republic. Retrieved 16 May 2014. ^ "La Biblioteca - Informazioni generali - Patrimonio librario" (in Italian). Biblioteca Nazionale Centrale di Firenze. Retrieved 7 March 2011. ^ "The Jagiellonian University Library Collection". Biblioteka Jagiellońska. 31 December 2009. Retrieved 7 March 2011. ^ "Herzog August Library - Inkunabeln -Bestandsgeschichte" (in German). Retrieved 15 October 2015. ^ "Biblioteca Nacional de España - Colecciones - Incunables" (in Spanish). Biblioteca Nacional de España. Retrieved 1 May 2013. ^ "Raccolte - Opere a stampa" (in Italian). Biblioteca comunale dell'Archiginnasio. Retrieved 8 March 2011. ^ "Collections" (in French). Bibliothèque Mazarine. Retrieved 8 March 2011. ^ "Patrimoine : Manuscrits et Livres anciens" (in French). Bibliothèque de Colmar. Retrieved 12 December 2014. ^ "Inkunabeln" (in German). Universitäts- und Landesbibliothek Tirol. Retrieved 20 March 2015. ^ "Incunabula Short Title Catalogue". British Library. Retrieved 12 July 2015. ^ "Collezioni" (in Italian). Biblioteca nazionale centrale di Roma. Retrieved 8 March 2011. ^ "Incunaboli" (in Italian). Biblioteca Nazionale Universitaria di Torino. Retrieved 8 March 2011. ^ "Incunabula". Biblioteca Nacional de Portugal. Retrieved 15 March 2011. ^ "Il patrimonio bibliografico" (in Italian). Biblioteca Universitaria di Padova. Retrieved 8 March 2011. ^ "Concise history of the monastic library". Royal Canonry of Premonstratensians at Strahov. Retrieved 16 May 2014. ^ "Les imprimés" (in French). Bibliothèque Sainte-Geneviève. Retrieved 8 March 2011. ^ "Manuscript and Rare Books". Walters Art Museum. Retrieved 8 March 2011. ^ "Bibliothèque Municipale de Lyon" (in French). Lectura. Retrieved 8 March 2011. ^ "Institución Colombina - Biblioteca Colombina - Incunables" (in Spanish). Institución Colombina. Retrieved 1 May 2013. ^ "Rare Books". Rare Book & Manuscript Library, University of Illinois. Retrieved 22 August 2011. 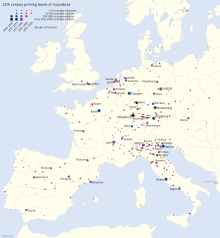 ^ "Incunabula: Printing in Europe before 1501". Bridwell Library, Perkins School of Theology, Southern Methodist University. Retrieved 4 January 2011. ^ "Glasgow Incunabula Project". University of Glasgow. Retrieved 16 August 2012. ^ "Médiathèque Ceccano" (in French). Mairie d'Avignon. Retrieved 9 March 2011. ^ "La Bibliothèque Humaniste en quelques chiffres & dates" (in French). Bibliothèque Humaniste de Sélestat. Retrieved 9 March 2011. ^ "Médiathèque de la Vieille Ile. Haguenau, Bas-Rhin" (in French). Catalogue collectif de France (CCFr). Retrieved 12 December 2014. ^ "Printed Books". Folger Shakespeare Library. Retrieved 3 October 2015. ^ "Collections". Special Collections Library, The University of Michigan. Retrieved 7 April 2013. ^ "Strasbourg - Médiathèque André Malraux" (in French). Catalogue collectif de France (CCFr). Retrieved 12 December 2014. ^ "Incunabula". Harry Ransom Center, The University of Texas at Austin. Retrieved 12 May 2011. ^ "Åbo Akademis biblioteks inkunabler" (in Swedish). Åbo Akademi University. Retrieved 16 September 2013. ^ "Rare Book Collections". University of Chicago Library, Special Collections Research Center. Retrieved 20 August 2011. ^ "Incunabula specimen search". SL-NSW. Retrieved 9 December 2018. ^ "Incunabula". University of Toronto. Retrieved 7 January 2016. ^ "Dartmouth College Library /All". libcat.dartmouth.edu. Retrieved 26 January 2017. This page was last edited on 22 March 2019, at 03:42 (UTC).